British newspaper The Sun has launched a new brand campaign, “Let’s Get Involved”, featuring actor Daniel Hoffmann-Gill. Three TV adverts shows Hoffmann-Gill reciting poems on everyday British life while walking through the streets of Hatfield, moving through an array of stadium crowds and sitting in the stands. He is joined by dozens of Brits from all walks of life, including nurses, bakers, builders, police officers, mums and even a few glamorous Page 3 girls. 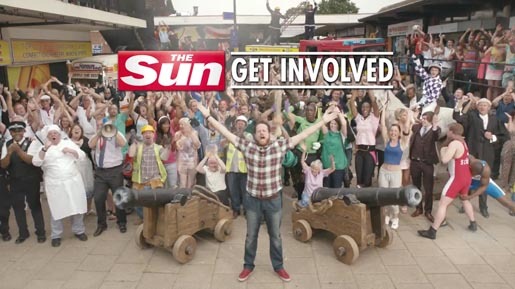 The Get Involved campaign was developed at Team News, the group of WPP agencies led by Grey London, by chief executive officer Deborah Kerr, executive creative director Nils Leonard, creative director Dave Monk, producer Jacqueline Dobrin, production assistant Joe Arojojoye, business directors Rossa Shanks and Tamsine Foggin, News International director of marketing communications Nick Stringer and communications director Jason Coward, working with The Sun marketing director Rob Painter. Filming was shot by director Keith Schofield via Caviar with producer Caroline Hicks. Editors were Tim Thornton Allen and Patrick Ryan at Marshall Street Editors. Post production was done at The Mill by post production producer Tom Johnson and colourist Aubrey Woodiwiss. Sound was produced at Grand Central by engineer Munzie Thind.